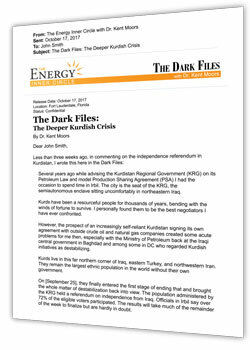 Dr. Kent Moors has been on the front lines of global energy for 30 years now. His connections offer you an unprecedented way to profit from sudden shifts in the dynamics of world energy markets. And now, for the first time, he’s agreed to share the industry’s most lucrative secrets – investment recommendations he reveals to members of his Energy Inner Circle. 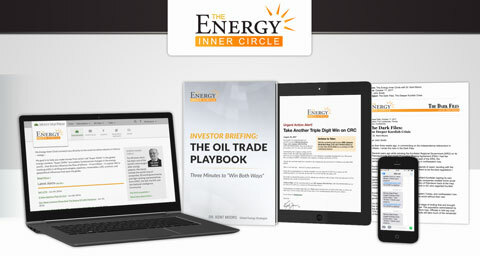 If you’re an Energy Inner Circle subscriber, click here to login. If not, see below for more information about Energy Inner Circle. I’m Dr. Kent Moors. I have a quick lesson for you in oil trading today. It’s a way to make anywhere from three to nine times your money in oil in the next 60 days – no matter which way the price moves. What I LOVE about this technique is that you can see in advance exactly how much money you stand to make. You could walk away with $63,300 on this single trade. And that’s just one projection. The fact is, the upside’s unlimited. Look, this is the only trade I’ve ever seen capable of turning $10,000 into $300,556… over 30 times your money. Now I believe the market is setting up perfectly to do it again. Is 30 times your money exceptional? Absolutely. Nothing’s set in stone and gains this big don’t happen every day. But the history of the oil market is replete with millionaire-making situations like this one. Long story short, right now is one of the best times I’ve ever seen to enter this trade. And it costs next to nothing to get started. You can be in this trade today for as little as $230, but you can go as big as you want. There’s no limit on how much you can put into this trade – or how much you can make from it. Just to be clear, oil makes this trade possible, but it’s NOT an oil investment. It’s not stocks, bonds, or anything long-term. It’s not an investment – period. It’s a TRADE. A short-term way to make nearly seven times your money – or more – without buying a drop of oil. Here’s where it gets really good: You don’t have to know which way oil prices are heading. Again, that’s the beauty of this technique. It works the same whether oil swings up or down. You see, the trade covers both sides. So as long as the price moves, as I believe it will, you can make a killing. Now, you never see average investors trading this way, because they don’t know how. But traders at Goldman Sachs, Morgan Stanley and Deutsche Bank do it all the time. All it takes is three minutes and one extra mouse click. One thing you should know is that the trade I’m talking about only works with one specific security. It was issued by a Delaware limited partnership in 2006 and is now run by two Berkeley grads out of a small office in Oakland, California. The good news is that it is extremely liquid. So it’s easy to move in and move out. 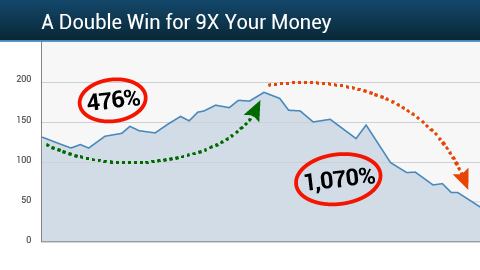 But best of all, it gives you a real chance to turn $10,000 into $92,454 or more in the next 60 days. To make this kind of money in a REGULAR trade, you’d have to bet on which way crude prices are heading. If oil shoots UP, it can make over nine times your money… while if the price takes another hit, it can make you more than three times your money. And those are conservative numbers. It could be a whole lot more. Say oil moves up to $55… just about $5 higher than it is now. You could walk away with $26,537 – more than double your money. At $65, where it was 18 months ago, you stand to make $188,490 – over 18 times your money. At $75 oil, you could score $450,147 – more than 45 times your money. And if oil keeps moving higher? Well, at $85, $10,000 could become $613,367. $95 oil would let you haul in nearly a million dollars $826,586 – more than 82 times your money. Now, there’s no law saying that oil has to go up. That’s why I’ve set up the other side of this trade recommendation so you can win if oil goes LOWER, too. If oil drops to $40, where it traded last year, you could have $15,283. If it hits $35 a barrel, like it did in December 2015… you’d make $21,288. At $30 oil, where it traded just last year, you stand to make more than 3.4 times your money. That’s why I call this the “Win Both Ways” oil trade. You can profit when oil moves in one direction, then hold on and win again when the price moves the other way. So is it possible to lose money on this trade? Of course. Any unforeseen event can derail even the most perfect analysis. Or one side of the trade may not pan out, cutting into your net profits. But the only way you WON’T get a shot at this kind of money in the next 60 days is if oil barely moves at all. And from what I’ve seen in oil during the past 40 years, I’m forecasting the price will move more than enough to make this trade pay off big. And I’m willing to put my money where my mouth is. I’ll tell you more about that pledge and what’s in it for you in a minute. Wall Street insiders call highly unusual situations like this an “asymmetric trade,” where the payoff so far outweighs the cost that it can make overnight millionaires. You can put down next to nothing. And your upside is unlimited. Remember, all you need to make money in this trade is for the price of oil to make a meaningful move. And it could move… a LOT. In fact, as I’ll show you in a moment, a BIG jump could hand you gains of 56 times your money. Pierre Andurand is one of the best-known oil traders in the world. He took the industry by surprise when he successfully called oil’s collapse from $150 down into the $30s – in just five months – back in 2008. And now he’s making a prediction that oil prices are heading to $70. If he’s right, this trade could hand you gains of $293,537. When OPEC started putting the pressure on American producers, billionaire oilman T. Boone Pickens called for oil to rebound to $100 per barrel. Pickens has been in the oil industry for 50 years and has seen five boom-bust cycles in oil prices. If he’s right about $100 oil, you stand to make up to $933,196… more than 93 times your money. But what if these guys are completely wrong? Well, if oil prices take a hit, you could STILL make money in this trade… a lot of money. Analysts at Morgan Stanley were calling for “oil in the 20s” just last year. And they’ve just downgraded their forecasts for this year even further. 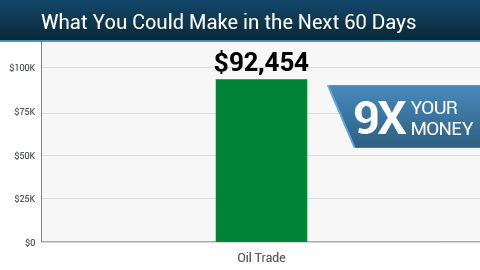 Say oil hits $25 – you could make $63,300. You could make $125,368 – more than 12 times your money on this trade. But that’s nothing compared to what you’ll make if oil REALLY crashes. Economist Gary Shilling was in charge of forecasting for Exxon before he turned 30. He was voted the #1 economist on Wall Street… TWICE. And he’s also been named the country’s #1 commodity trader. Shilling says today’s massive supply glut will drive prices down to $10 per barrel. If Shilling is right, you could be looking at more than 22 times your money… $223,300. Look, it’s pretty obvious that oil forecasts are all over the place. 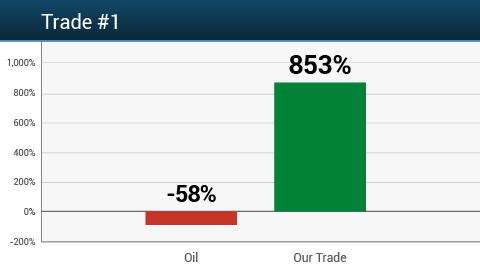 I’ve been tracking oil prices for 40 years, and I’ve never seen such a huge gap between the bulls and the bears. And that’s EXACTLY what you want to see when you enter this trade. Because it doesn’t matter who’s right about oil. The bottom line is that you make money when the price moves. The more it moves, the more you make. The DIRECTION doesn’t matter. From 2015 to 2016, oil prices went down, up, and then down again… and both sides of this trade never stopped working. In fact, you could have turned $10,000 into more than half a million dollars in about 14 months. Between June 2015 and February 2016, oil went from $61.36 down to $26.19 – a fall of 58% in about eight months. And just one side of the trade I’m talking about would have turned that move into an incredible gain of 853.1%. Your starting stake of $10,000 would have become $95,313. In the next five months of 2016, oil reversed course… and ran up to $49.71… a gain of 89%. But your second trade would have worked perfectly… turning your $85,313 into $157,411. Yet that quick fall in price was enough to earn you another 256.25%. That would have given you $560,777. And you’d still have your original money in your pocket. Anyone could use an extra half million bucks. Especially when all you have to do is make a few mouse clicks. Now, it’s doubtful that many people knew enough to follow this string of plays and make all those exact moves last year. It takes great timing and these are exceptional results, no doubt. But these real cases come straight from the market, so they show what can happen going forward. If anything, this trade has even more potential TODAY than it did last year. Just look at this chart. 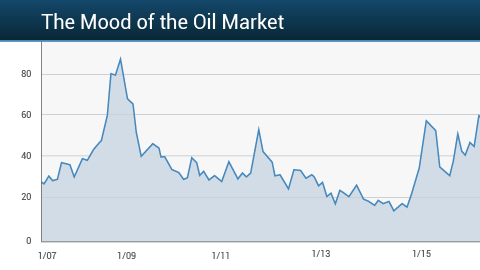 It shows you the “mood” of the oil market. When the line drops, it means the market is calm and relaxed. Oil buyers start getting tense. And the line jumps higher. It took 11,484 calculations to get the data points to create that chart. 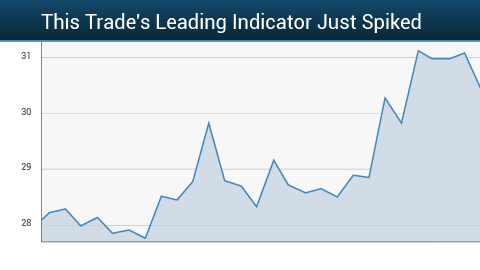 But all you really need to know is that every time this line spikes, it sends trades like these soaring. We’ve just seen this line spike up again. And when it shoots up VIOLENTLY, it means oil prices are going to move up and down extra fast. Which is exactly when this technique works best. When this line spiked in 2008, this trade would’ve produced the biggest returns I’ve ever seen. The FASTEST, too. If you made the trade I’m talking about on September 19, 2008, you could have doubled your money in one trading day – and that was just one part of the position. This trade wasn’t in the news. You didn’t hear about it on CNBC. Yet it turned $5,000 into $10,750 in less than 24 hours of trading. Now, a double in one day doesn’t happen every day. Sometimes staying with this trade a little longer opens the door to more money – A LOT more. On July 14, you could have entered one part of this trade for just $90. On December 31, you could have cashed out with $2,705. You would have turned $10,000 into $300,556. Now, here’s where we stand today. We’re now at this red circle. After the spike we’ve just seen, the setup is now perfect to get into this trade. Back in 2008, all it took was $90 to make $2,705. Now you have a chance to do the same thing again – using the trade I’m recommending today. And just like in 2008, you can get in for next to nothing. Because I’d never recommend anyone put more money in a trade than they can afford to lose. Of course, this is shaping up to be one of the best opportunities I’ve ever seen for this trade in my 40 years in the oil business. I don’t know when we’ll see it again… and I’m not going to wait. I’ve just put together a detailed Oil Trade Playbook that explains exactly how to make this trade. It walks you through each step of the transaction. I’ll tell you how to get the Playbook in a minute. You can win twice on the same trade. That’s right: Not only can this trade make you money whichever way oil moves… but you can actually profit TWICE. My recommendations have done it before. The last time it happened, my readers posted an 81% gain on a Friday and a second 92% gain the following Tuesday. A double win in less than a week. AND $63,300 if it falls right back down even further. You’d win twice and pocket a total of $251,790. Let me show you exactly how a double payout happened in 2008. Over the first half of that year, oil rose 45.9%. By June 30, this trade turned that move into a 476% gain. $1,000 became $5,670. Then when oil reversed course in June, the second part of this trade did even better, making a 1,070% gain. That turned $1,000 into $11,700 by the end of the year. Add it up and you could have made $17,460. All from a $2,000 investment. You’d think that setting yourself up for a shot at nine times your money in ANY sort of trade would be complicated. But with my step-by-step instructions, the one I’m recommending today makes it easy. If you trade online, it just takes one more mouse click than usual. You’ll be done in three minutes, start to finish. It’s easier than getting cash out of an ATM. If you use a broker, it’s just as simple. I’ll tell you exactly what to say, verbatim. It’s all of 18 words. I’ll even tell you how to phrase your order so you get a break on the commission. Professional traders – the guys who make money day in and day out from the comfort of their desk chairs – they’re making these trades right now. In fact, more than $20 million was riding on trades like this yesterday. Once I tell you how to enter and exit this trade, you could make the same gains professionals do. You just need to learn how. And as soon as you get my instructions you could be up to speed in 10 minutes. I’ve worked in the energy field my entire career. That makes 40 years and counting. I advise 27 governments on their energy policies… including Russia, China, Iraq, and Australia. On top of that, I consult for OPEC, the European Union, and the International Energy Association – mostly on oil supply forecasts. I’ve advised every major agency of the U.S. government on energy matters… plus most of the major energy companies on the planet. In fact, I am on retainer with 6 of the world’s 10 largest oil producers right now. I’m helping them restructure their businesses. I’m not telling you all this background stuff just to hear myself talk. I’m doing it so that you give the trade I’m recommending serious consideration. I’ve been on TV and radio more than 2,100 times, breaking down energy policy on CNBC, BBC, ABC, and Fox. But I’ve never explained this trade to anyone but my readers. I returned from my latest trip to London more convinced than ever that it’s time to make this oil trade. I flew over for a private meeting at Windsor Castle that brought together the major energy players from six continents. I had three days of intense discussions with 15 ambassadors, high-commissioners, OPEC ministers, and multinational energy CEOs. These are the policymakers and private sector leaders who will decide what the energy market will look like over the next 12 months. As the conference closed, I was struck by something I hadn’t seen in any of the eight previous Windsor events I’d attended. There was NO consensus on where oil prices are headed. Half the group was convinced that oil is way oversold and that the price will rebound sharply. And just as many were predicting the opposite. Even the diplomats from big OPEC countries in the Middle East were divided. This is the perfect setup for a trade that makes you money directly from uncertainty in the oil market. That’s why I’m about to send it out to the members of my premium investment research advisory, Energy Inner Circle. I launched this service in 2010 with one goal: to show members how to profit from opportunities in the energy market before mainstream investors even know they exist. The key is to get in EARLY, on the ground floor… and be taking profits while outsiders are just getting on the bandwagon. Like every other investor, I don’t have a crystal ball. But I do have direct access to the major players in the energy world. I know the big buyers and sellers… and I know the policymakers who make the rules. And they know me. In fact, a multibillion-dollar global energy deal was once closed in the living room of my vacation home in the Bahamas. After 40 years inside this industry, if there’s anyone with more connections in the corporate suites and government bureaus of the energy world, I haven’t met him yet. When I want to know who the winners will be from a new oil discovery, for example, I pick up the phone and call the executives actually making the decisions. That’s why I call my investment research service Energy Inner Circle. Wherever I go, my readers are right there with me as I talk to the ministers green-lighting major energy projects and the CEOs pushing them through. Like when I went to Ecuador to oversee a $13 billion, 300,000 barrel-a-day oil refinery with Ecuador’s Minister of Energy, an old friend who used to be president of OPEC. And when I travelled to Argentina to explore a $40 billion project that will give a Chinese energy firm I advise direct access to 393 million barrels of oil reserves. The company selling all this oil could make fantastic profits for Energy Inner Circle members. I’m thinking the floor here is a 300% gain – the ceiling is unlimited. My work takes me to every part of the world. And to every sector of the energy complex. 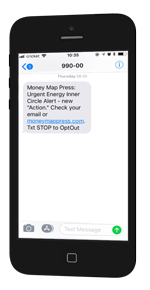 You’ll find ways to profit from them all in Energy Inner Circle. In natural gas, I’m looking at a small company that’s targeting Russia’s iron grip on the $94.5 billion European market. But Europe is just one piece of this company’s enormous global network. And that’s on top of the 20 other countries it’s begun exporting to… including Mexico, Chile, Japan, Argentina, India, Turkey, and Kuwait – to name a few. As this company moves deeper into the European market – and expands its reach around the globe – I’m expecting shares to more than double in the next 12 months… and double AGAIN in the 12 months after that. In refining I’ve found a way to profit from a revolutionary process that actually changes the molecular state of oil. When it does so, it actually expands the volume of oil by 35%. If you start with one barrel of oil… you end up with 1.35 barrels of oil. Imagine instantly increasing your oil output by 35% simply by switching to this refiner. It’s like taking a bushel of wheat to the mill and walking away with 1.35 bushels of flour. The kicker is that the company with a stranglehold on this free-oil technology is as little as 1/10th the size of Exxon, Shell, or BP. Plus the stock trades at a ridiculously low 0.4 times sales. The sector median is 1.1. This is an incredible discount. We could be in for a wild ride as this technology rolls out. I think 1.1 times sales is a reasonable multiple for a company like this. That would push the stock up 244% higher than it is today. And guiding my readers to windfalls from refiners is nothing new. We locked in cumulative gains of 455% in Golar… 394% in Headwaters… 351% in Western Refining… 325% in Valero… and 214% in Delex. And the winners are racking up fast. In the four and a half years since I launched this service, on average, my readers could have doubled their money in a different trade every 73 days on average. Most investors go years between doubling their money. In Energy Inner Circle it happens every 73 days. That includes some of our best quick scores of 244%, 352% – even 542% in just 19 days. And a gain of 103.2% in Walter Energy (WLT) in four months. A 51.5% profit in Goodrich Petroleum (GDP) in just 14 trading days. 68.8% in GT Advanced Technologies (GTAT) in 42 days. And 92.6% in Halliburton (HAL). But readers across my services had a chance at even bigger gains, including a 368.4% score in Cheniere Energy (LNG). Cheniere is an interesting case because it gave my readers so many chances to profit throughout the year – 10 triple-digit winners in all. They closed out gains of 181.4%… 195.7%… 279.7%… all the way up to 368.4% in this one stock. But the oil trade recommendation I want to send you today has a higher projected payoff than any of these trades – and could come in faster, too. You could make $125,368… and quite possibly $933,196… all from a transaction that takes just three minutes to register. Professional traders are using this technique right now. There’s no reason you can’t, too, once you know how. Conditions for this trade won’t stay this perfect for long. So don’t make the mistake of missing out on the first wave of profits. My top concern in ANY trade is to get in EARLY. Those 100% gainers wouldn’t be coming in about every 11 weeks if I wasn’t serious about that. And since this might be a quick trade, you should think now about what to do with a sudden influx of cash. If you invest $10K and end up with $125K, that’s an extra $115K you didn’t have before. If it all happens in 60 days, that comes to $2,066 per day. You could get a new luxury car… take an anniversary cruise… or surprise your spouse with a stunning piece of jewelry. And still have plenty of money left over. Like anything in life, absolutely nothing is guaranteed. No credible investor would ever make that claim. But there is one thing I can guarantee: no trade on earth, no matter how phenomenal it is, will make you money until you move on it. And I’m ready to send you the details on this trade now. All I ask is that you give my Energy Inner Circle research a try, risk-free. During your 30-day trial period, you’ll have access to my entire model portfolio… and you’ll also get every new trade I release. 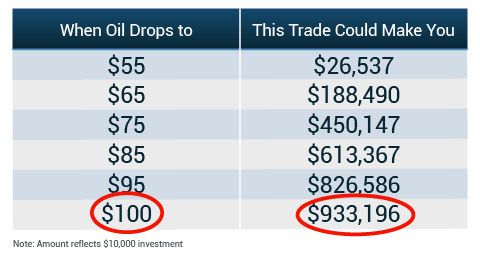 Of course, the first trade you’ll receive is the “Win Both Ways” oil play that could make you $94,000 in the next 60 days. And that’s on just one part of the play. Like all the Urgent Trade Alerts I send to my Energy Inner Circle members, this one will go directly to your email inbox, complete with all the details you need to make your move. These Urgent Trade Alerts and the research behind them are the crux of my service – where those 100% winners have been coming in every 11 weeks. I send these opportunities out as soon as I discover them – usually about once per week. With each new trade I’ll email you simple step-by-step instructions, along with the best price to buy in. I also include my thinking BEHIND the trade so you can see the “why” and not just the “what.” When it’s time to cash out you’ll get a separate alert within minutes of my trading decision. If you want to act fast wherever you are, I’ll text your cell phone to let you know my newest recommendation is ready. This texting service is optional, but it’s the best way to make sure you don’t miss anything important. For example, I was on a flight to London when a fuel stock in our portfolio reported awesome earnings. Within hours we were sitting on a gain of 118%. I didn’t want to see those profits slip away before I got back to the office. So as soon as I hit the ground at Heathrow I issued a trade alert to take triple-digit profits. Anyone receiving my texts would have known a trade alert was waiting in their email… so they could move on it as soon as the market opened in New York. You’ll also start getting my Market Update every week – a brief rundown on emerging trends in energy that we can play for a quick score. So far, we’ve hit 93 double-digit gains this way – including profits of 79%, 87%, 93%, 99%, and dozens more. Finally, you’ll get total access to my website, where you’ll find every trade, weekly update, and special report I’ve issued since I launched my service almost seven years ago. Whenever you want to check how our recommended trades are doing, simply log on and you’ll see current prices in our Live Portfolio. That way you always know where we stand with every play. So what’s it worth to get direct access to my opportunities that mainstream investors will never get and never even know exist outside of my Inner Circle? The cost to become a member of my Energy Inner Circle is $4,000. Plus a website where you can see how our plays are doing in real time. That’s a ridiculously low price considering how much money you could be making within weeks. The very first trade recommendation you’ll get has the very real potential to hand you 63 times your fee within 60 days. I want to make SURE you have everything you need to make the kind of money you deserve in these troubling times. On perhaps the ONLY area of the markets that’s NOT in a bubble. And just to show you how serious I am about my mission, I’m adding my DOUBLE guarantee that makes joining Energy Inner Circle a no-risk, can’t-lose deal. Check out Energy Inner Circle for a month. Take your time getting to know what I do. Look at the portfolio and see every one of my recommendations. Make a few trades yourself if you want. If any time in the first 30 days you’re not happy, simply let me know and I’ll refund every penny of your subscription fee. You’ll pay nothing for your membership. OK, that’s your SATISFACTION guarantee. My next guarantee concerns PERFORMANCE. I’m so sure this trade will make money that I’m willing to GUARANTEE it. Here’s what I’ll do: Either this trade shows a profit in our track record over the next 12 months, or just give me a call and I’ll extend your Energy Inner Circle membership for another year – on the house. You’ll get $4,000 worth of my research and trade alerts at no charge. I can’t remember the last time I had to work free for anyone. And that’s good news for me AND them. Because it means they’re making money. By the way, this second guarantee is a separate stand-alone promise. So even if you double your money in every other recommendation I send you, I will STILL give you an extra year free if this oil trade doesn’t work out. I came up with this double guarantee to make it a no-brainer to try Energy Inner Circle. And to give you a little extra incentive to check out my new oil trade recommendation as soon as you can. Most people have no clue how this technique works. I doubt one investor in 1,000 has ever tried it. My Oil Trade Playbook will explain it all in a snap. You’ll get all the steps you need to execute the trade, of course, and you’ll also get a few handy tips on how to upgrade your brokerage account so you can make this kind of trade whenever you want. Again, it’s not stocks, bonds, or anything long-term. It’s just a quick way to make money without buying a drop of oil. But I urge you to act now. We’re seeing a spike up in this trade’s leading indicator… making this an excellent time to get in on this trade – before it starts to really move. Keep in mind… when this trade was set up like this before, traders who knew what to do turned $10,000 into $300,556. The time to make your move is NOW. The minute I hear from you, I’ll send you the exact steps you need to put yourself into this trade. If you trade online, all it takes is one extra click of the mouse. If you use a broker, I’ll send you the 18 words that let you profit no matter which way oil moves. Phrase your request this way and you’ll even get a discount on your commission. You could start with $10,000 and walk away with $125,368. Or even as much $933,196, if oil rises to $100 as T. Boone Pickens predicted. I’ve never found a better risk-reward tradeoff in oil in the past 10 years. It’s the very definition of an asymmetric trade – where the payoff so far outweighs the cost that it can make overnight millionaires. In this case, the potential profit can be as high as 56 times your money. There aren’t many legitimate ways to make 56x your money this fast. When you find one, you take it. I will send you at least 6 (six) trades in the next 12 months that give you the chance to double your money. If our track record shows only five, just call customer service and we’ll extend your membership for another year. Since 2010, Energy Inner Circle has delivered an average of four of these 100% gainers per year, so the odds of making a few doubles are clearly in your favor. 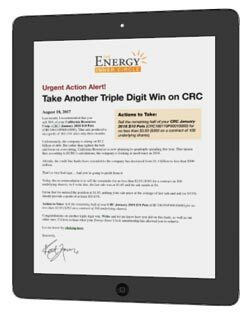 I closed four triple-digit winners for Energy Inner Circle readers last year – 143.9%… 114.2%… 133.2%… and 102.8%. And that’s on top of the 11 double-digit gainers we closed. First, you’ll get my top trade right now. Second, I’m going on record that this “Win Both Ways” oil trade will show profits. Third, you’ll get six recommendations that could double your money in the next year – or I’ll work for you FREE for another year. In other words, I’m willing to put $4,000 on the line twice. For the next month you’ll be on the inside with a group of folks who have been given the chance to double their money in a new trade every 73 days on average for almost seven years. So go ahead and hit the “JOIN NOW” button so I can send you my Playbook on the oil trade that could make you $95,000 in the next 60 days. You’ll see a summary of my invitation where you can take one last look at everything you’ll get in Energy Inner Circle… BEFORE you make your final decision. 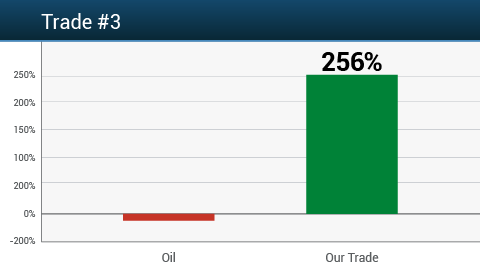 As soon as you do decide, I’ll send you a Trade Alert with full instructions for placing the “Win Both Ways” oil trade. I’ve told you everything I can. It’s your move now. So let’s get started. I’m ready to send out this trade. Conditions won’t stay this perfect for long. On the next page you can review everything we’ve talked about before you decide to accept a trial membership. And then, even after you accept it, you will have 30 days to test drive Energy Inner Circle. If you’re not 100% overjoyed… if I don’t EXCEED your expectations – simply contact my special VIP service for a quick, no-hassle refund. The button below will take you to the membership form. But please, don’t wait another moment. You could start making tremendous sums of money TODAY. Right this very minute. And with my three guarantees, you’ve got nothing to lose and everything to gain. Very few individuals ever get the rare opportunity to get in on the inside… the chance to know ahead of time who’s pulling the strings… to learn how profits are really “wired”… and to be on the receiving end of those gains. So please, act now. Don’t wait another minute. I’m Dr. Kent Moors, and I want to thank you for joining me today.